Industrial Acrylic Gloss is a industrial fast dry DTM, waterborne acrylic gloss enamel for metal shop use or OEM applications only. Designed for application on properly prepared ferrous and non-ferrous metal substrates. 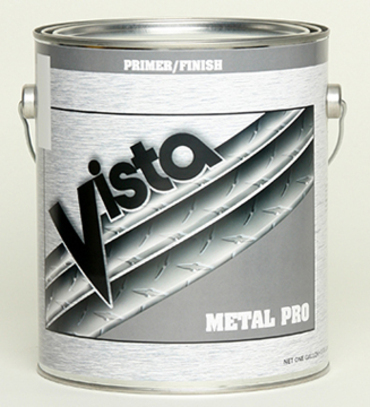 Low VOC, excellent adhesion, rust-resistance makes this product an excellent alternative to traditional solvent-based alkyd enamels. For more information regarding DTM applications, contact a Vista Representative. FOR METAL SUBSTRATES ONLY. Recommended Uses: Ideal for use on steel, equipment, fixtures, refuse bins, trasnport-containers, wrought iron in shop-coat applications where minimal downtime is required. Outside of SCAQMD this product can be used on all metal surfaces. Colors: White, Black. Optional colors available in quantities of 50 gallon minimums.